These chicken wraps give a creamy twist to a traditional BLT. Heat oil in large skillet over medium-high heat. Add chicken; cook, stirring occasionally, for about 15 minutes or until thoroughly cooked. Transfer chicken to a plate. When cool, cut into 1/2-inch squares. Cook bacon according to package instructions until crisp. Transfer to a paper towel-lined plate and set aside. Crumble when cool. Toss together lettuce, tomatoes, bacon, and chicken in a large bowl. Add dressing; toss again. 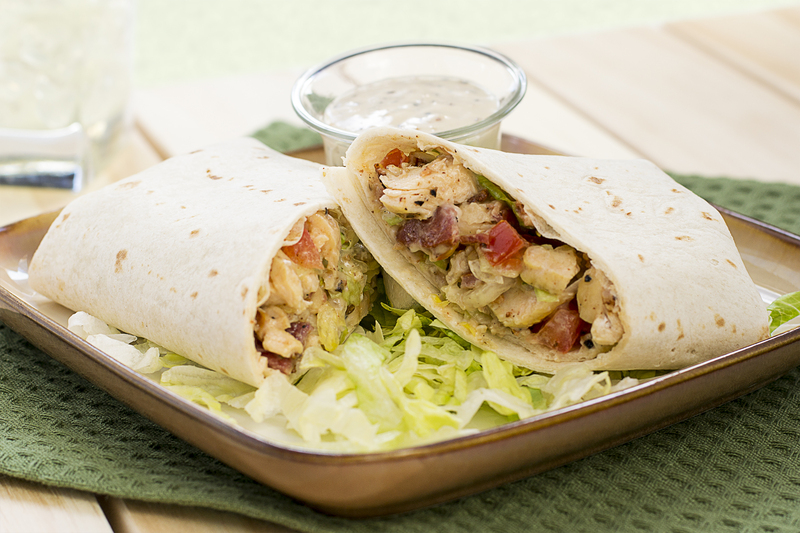 To assemble each sandwich, spoon about 3/4 cup of chicken mixture into the center of the tortilla. Fold right and left sides of tortilla inward toward the center and over the filling; next, fold bottom edge upward toward the center and then firmly roll tortilla away from you until it completely wraps the filling. Serve with a fruity salad, such as spinach and strawberry salad with pepper vinaigrette.